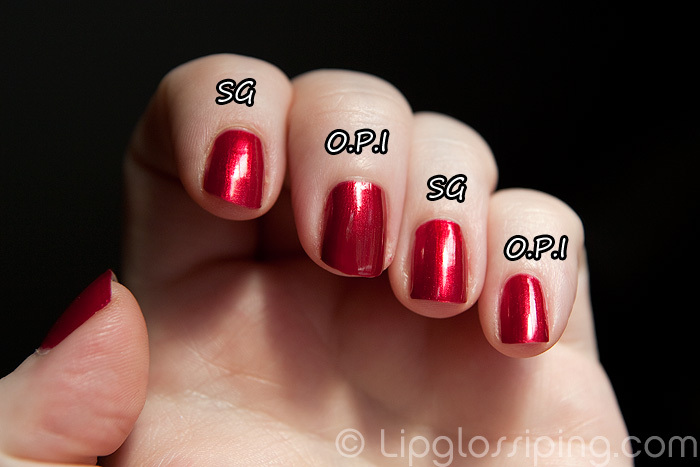 INRAW was the first OPI I bought back in the day and is probably the only bottle of polish I’m even close to finishing. If I look *really* closely, I’d say that Stargazer #155 is the teeniest bit more cherry toned than INRAW, but there’s barely anything in it. 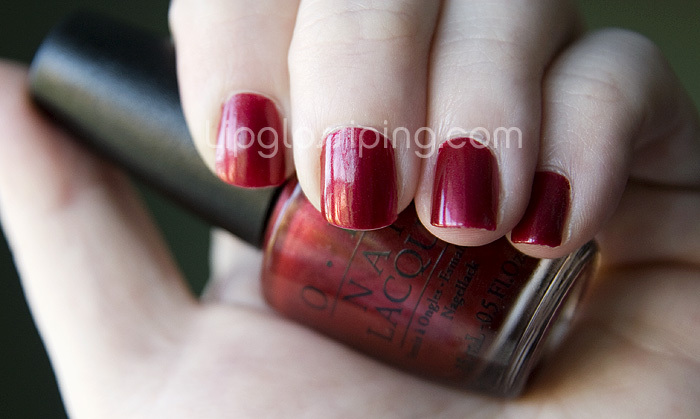 #155 is opaque in two coats and applies smoothly with a decent brush… not too thin and no straggly long bits. Quick drying but affording just enough time to work the polish to the edges of the nail bed. It benefits from a glossy top coat to bring out the sparkle within the polish. I prefer the Stargazer. 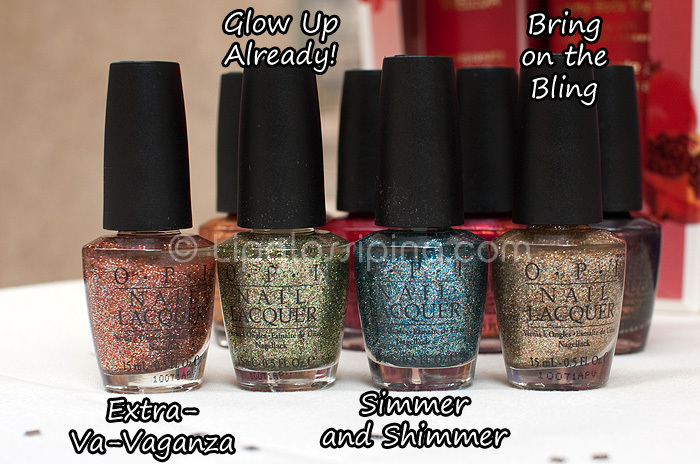 I’ve always had an issue with tip wear with this particular OPI (see my review from last May) and the Stargazer is outperforming INRAW in this instance by a huge amount. No tip wear at all until the 3rd day. 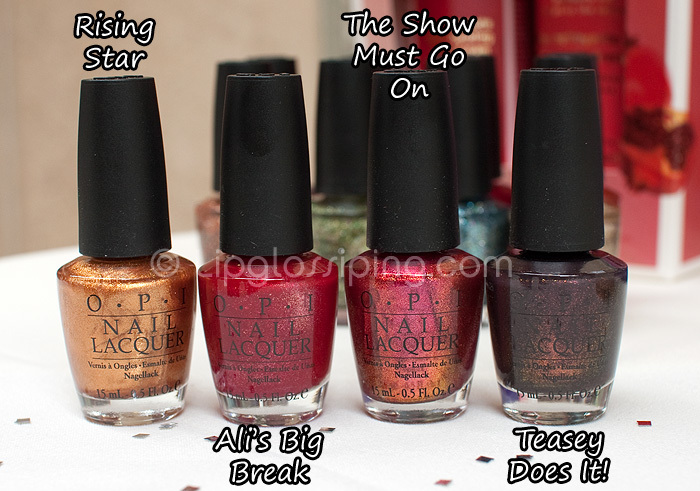 I was hugely excited to find OPI – Absolutely Alice in my latest parcel of goodies, although I can’t pretend I’d forgotten I’d ordered it… I have been pacing like an expectant father ever since handing over my Visa deets! Absolutely Alice is amazing, a true blue and the sparkles? Oh my… the sparkles are breathtaking. I couldn’t stop twirling the bottle in the light, watching the glitter dance and flash blue and silver. Fantastic. Photography doesn’t really capture the sparkle that emanates from this polish, but the hue is true to life and you can see how great the coverage is from 3 coats. 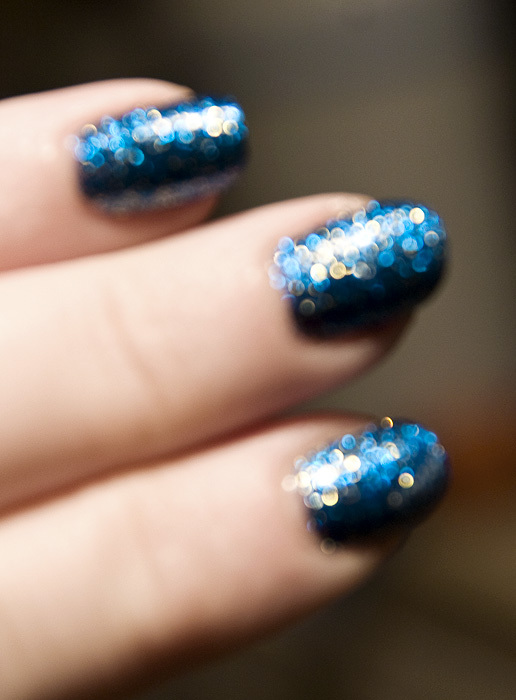 The glitter is suspended in a sheer jelly base, so I’m pleasantly surprised at the opacity I was able to achieve. Dear god, I’m not looking forward to removal. Screw it, I’ve just ordered it. Man I’m a good enabler! EDIT: Rhamnousia reminded me, I forgot to say… This definitely needs a couple of coats of top coat to make it bearable to touch! Gritty glitter! EDIT EDIT EDIT(!! ): How many edits can I get on a post? Ok… shouldn’t really add this but before you think I’ve gone completely mad. Let me explain something about focus. You focus to achieve optimum sharpness within an image. That is a given right? If your focal plane is off, you will achieve blurriness, but a pleasant side effect of blurriness is a little something called ‘bokeh’. Bokeh is the technical term for the out of focus areas in a photograph and a very pleasing aspect of Bokeh are the discs of light that appear at the source of any highlights in an image…. it could be true light sources or reflections that cause this kind of bokeh. But yanowot? I don’t feel like a child in this polish. And we all know that I suffer ‘hand-hiding’ syndrome if I feel at all silly in a polish. But this shade and sparkle makes me feel amazing. High praise indeed, but I realised it was true this afternoon, before this edit. I simply couldn’t shop showing off my fingers when I was in the supermarket. I was rocking it!